GENEVA (AP) � Scientists at the world's biggest atom smasher hailed the discovery of "the missing cornerstone of physics" Wednesday, cheering the apparent end of a decades-long quest for a new subatomic particle called the Higgs boson, or "God particle," which could help explain why all matter has mass and crack open a new realm of physics. As the highly technical findings were announced by two independent teams involving more than 5,000 researchers, the usually sedate corridors of the European Center for Nuclear Research, or CERN, erupted in frequent applause and standing ovations. Physicists shed tears reflecting on the decades of work that brought them to this momentous occasion. 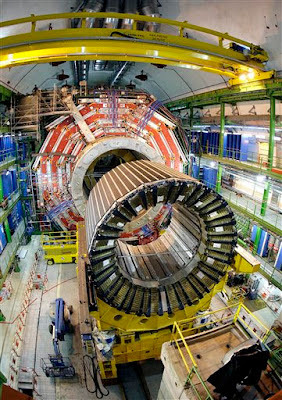 The new particle appears to share many of the same qualities as the one predicted by Scottish physicist Peter Higgs and others and is perhaps the biggest accomplishment at CERN since its founding in 1954 outside Geneva along the Swiss-French border. 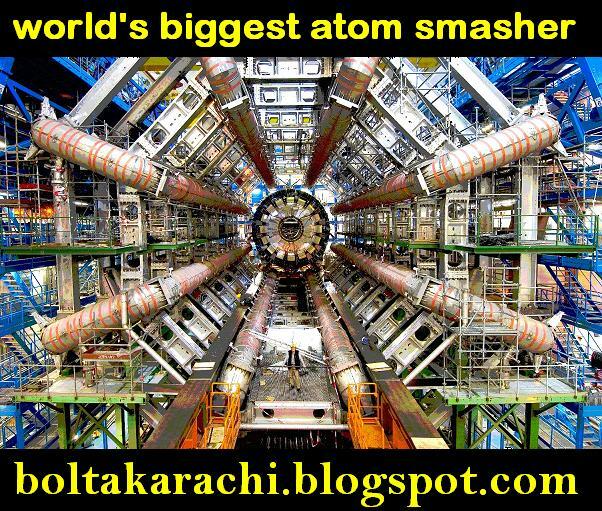 Rolf Heuer, director of CERN, said the newly discovered subatomic particle is a boson, but he stopped just shy of claiming outright that it is the Higgs boson itself � an extremely fine distinction. The Higgs, which until now had been purely theoretical, is regarded as key to understanding why matter has mass, which combines with gravity to give an object weight. The idea is much like gravity and Isaac Newton's early theories: Gravity was there all the time before Newton explained it. The Higgs boson was believed to be there, too. And now that scientists have actually seen something much like it, they can put that knowledge to further use. The center's atom smasher, the $10 billion Large Hadron Collider on the Swiss-French border, sends protons whizzing in a circle at nearly the speed of light to create high-energy collisions. The aftermath of those impacts can offer clues about dark matter, antimatter and the creation of the universe, which many theorize occurred in a massive explosion known as the Big Bang. Most of the particles that result from the collisions exist for only the smallest fractions of a second. But finding a Higgs-like boson was one of the biggest challenges in physics: Out of some 500 trillion collisions, just several dozen produced "events" with significant data, said Joe Incandela, leader of the team known as CMS, with 2,100 scientists. Each of the teams confirmed Wednesday that they had "observed" a new subatomic particle � a boson. Heuer said the discovery was "most probably a Higgs boson, but we have to find out what kind of Higgs boson it is." As the leaders of the two teams presented their evidence, applause punctuated their talks. "Thanks, nature!" joked Fabiola Gianotti, head of the team called ATLAS, with 3,000 scientists, drawing laughter from the crowd. Later, she told reporters that the standard model of physics is still incomplete because "the dream is to find an ultimate theory that explains everything. We are far from that." 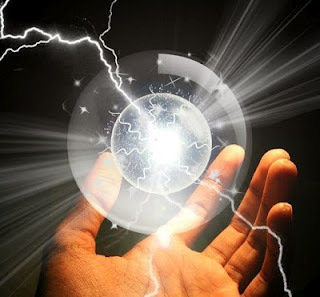 Incandela said it was too soon to say definitively whether the particle was exactly the same as envisioned by Higgs and others, who proposed the existence of an energy field where all particles interact with a key particle, the Higgs boson. Higgs, who was invited to be in the audience, said Wednesday's discovery appears to be close to what he predicted. "It is an incredible thing that it has happened in my lifetime," he said, calling the discovery a huge achievement for the proton-smashing collider built in a 27-kilometer (17-mile) underground tunnel. Outside CERN, the announcement seemed to ricochet around the world with some of the speed and energy of the particle itself. Marc Sher, a professor of physics at William & Mary College, said most observers concluded in December that the Higgs boson would soon be found, but he was "still somewhat stunned by the results." The phrase "God particle" was coined by Nobel Prize-winning physicist Leon Lederman, but it's used by laymen, not physicists, as an easier way of explaining how the theory got started. "This boson is a very profound thing we have found," he said. "We're reaching into the fabric of the universe in a way we never have done before. We've kind of completed one particle's story. ... Now we're way out on the edge of exploration." The discovery is so fundamental to the laws of nature, Incandela said, that it could spawn a new era of technology and development the way that Newton's laws of gravity led to basic equations of mechanics that made the industrial revolution possible. "This is so far out on a limb, I have no idea where it will be applied," he added. "We're talking about something we have no idea what the implications are and may not be directly applied for centuries."